On Wednesday, Jan. 10 the project team marked a major milestone toward completion of the Rosecrans Avenue / Bloomfield Avenue bridge project. A ribbon cutting ceremony was held to celebrate the official opening of the Bloomfield Avenue undercrossing at I-5 and the recent reopening of the northbound I-5 on- and off-ramps at Rosecrans Avenue. More than 80 people were in attendance to commemorate the opening of Bloomfield Avenue. The event was emceed by Caltrans District 7 Director Carrie Bowne and speakers included Supervisor Janice Hahn, representing Los Angeles County’s 4th District, Vice Mayor Leonard Shryock from City of Norwalk, Monica Gourdine, Associate Division Administrator from the Federal Highway Administration, and Captain David Moeller of the California Highway Patrol. 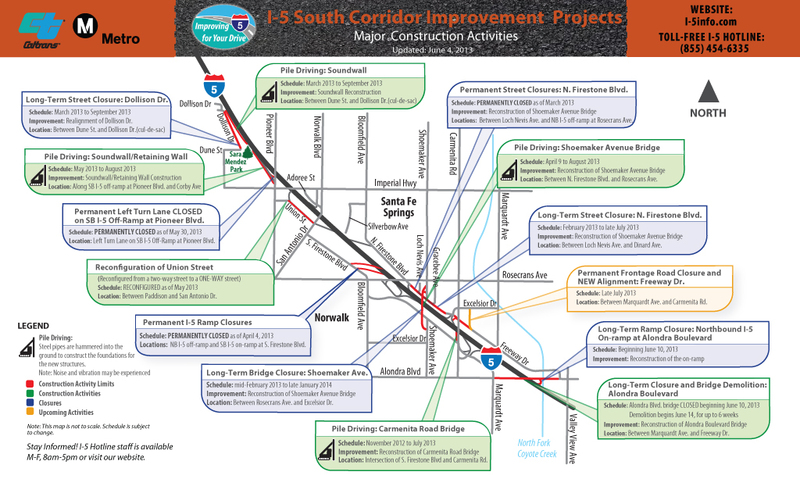 The Rosecrans Avenue / Bloomfield Avenue Bridge Project is the third in a series of six construction projects to widen the Interstate 5 South Corridor by adding one High Occupancy Vehicle (HOV or carpool) lane and one general purpose lane in each direction from the Orange County line to I-605. 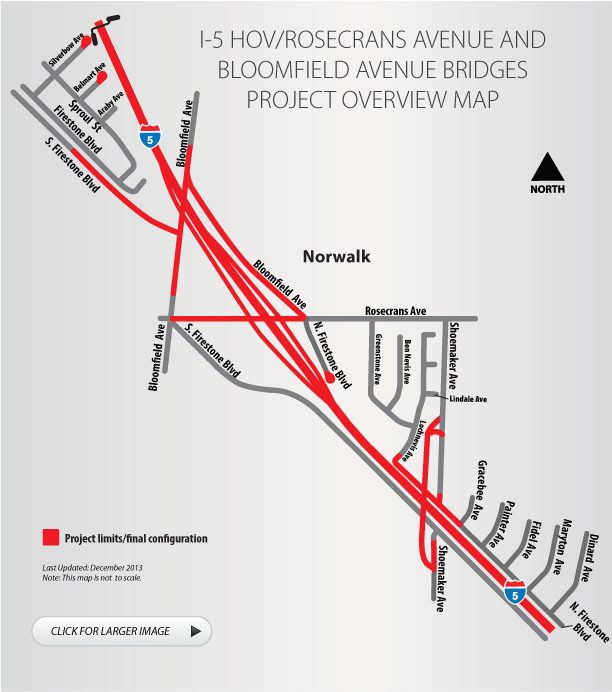 The Rosecrans Avenue / Bloomfield Avenue Bridge Project extends through the cities of Norwalk and Santa Fe Springs. In addition to the widening of I-5, project improvements include widening and reconstructing the Rosecrans Avenue undercrossings, the Shoemaker Avenue overcrossing, the Silverbow Avenue pedestrian overcrossing and construction of a new undercrossing at Bloomfield Avenue. For the first time since 1954, the Bloomfield Avenue undercrossing will allow motorists to pass underneath I-5, connecting communities and improving mobility for local residents. Project extends from Shoemaker Avenue to Silverbow Avenue in the City of Norwalk. The project will widen one mile of I-5 to add one High Occupancy Vehicle Lane (also known as HOV or car pool lane) and one general purpose lane in each direction. Three bridges will be reconstructed to accommodate the widened freeway, including Shoemaker, Rosecrans and Bloomfield avenues, as well as a pedestrian overcrossing at Silverbow Avenue. ramp designs and realignment to Firestone Boulevard. 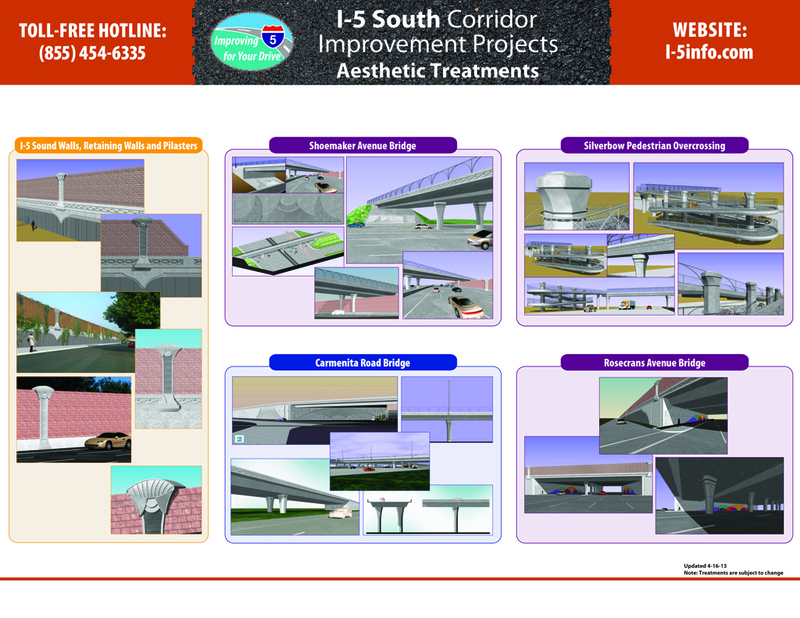 Caltrans is committed to keep the public informed about this construction effort. Notices of community meetings and updated construction advisories will be posted on this website periodically. Thank you for your patience. For more information, please call toll-free (855) 454-6335.